Technology Blue Book: How Much Are Used Electronics and Gadgets Worth? As any gadget enthusiast worth their weight in component video cables knows (and much to their chagrin), technology tends to get outdated very quickly. Just when you think you’ve got your surround sound speaker or home theater system perfected, a new standard or technology comes along to blow away the performance of your existing setup. It’s even worse for computers, which age incredibly fast. So what does that leave you with? In most cases, an attic full of outdated receivers, entry-level speakers, low-megapixel digicams and, of course, that iPhone with the cracked glass that cuts your ear every time you try to use it. This being the case, one can’t help but wonder: What to do with all the electronic clutter? Thankfully, the answer is both simple and good for your household budget – sell it! Here, we reveal several sites where you can get top-dollar in terms of resale or trade-in value for your used equipment, and offer several inside tips on how to earn more money for your gadgets and gear. This is a great site that offers instant quotes. It purchases used cell phones, Apple iPods, iPhones, laptops, desktop computers, PDAs, smartphones, MP3 players, old software with valid serial numbers, and video game consoles. What’s really cool about the online service is that, because quotes are instant, they can be adjusted on the fly if you, say, happen to find that missing charger and want to add that additional information to maximize the ultimate payout. 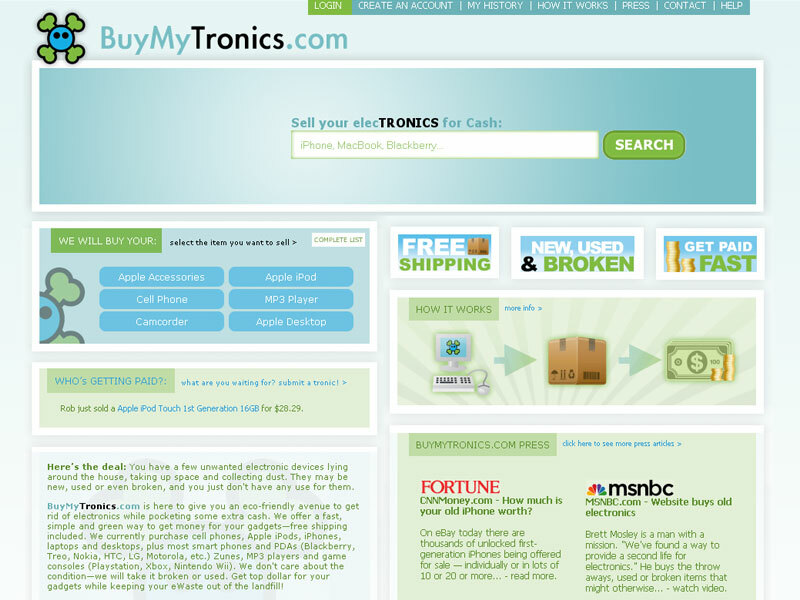 Bargain hunters can also source immediate quotes at this website, which offers to buy back a huge variety of electronics (unlike some other sites we tested). In addition to laptops, digital cameras, MP3 players, video game consoles, PDAs, and the other usual suspects, Gazelle will also purchase products that others services won’t. Think external hard drives, home audio products (we got a quote for a Bose Wave Radio for $121), movies, and projectors. They’ll even buy old calculators! Amazon won’t buy your gear outright, but it is a good place to go to sell your used electronics. Setup is kind of a pain (you have to wait for someone to call you back), but you can set your price and see what others are selling similar items for. 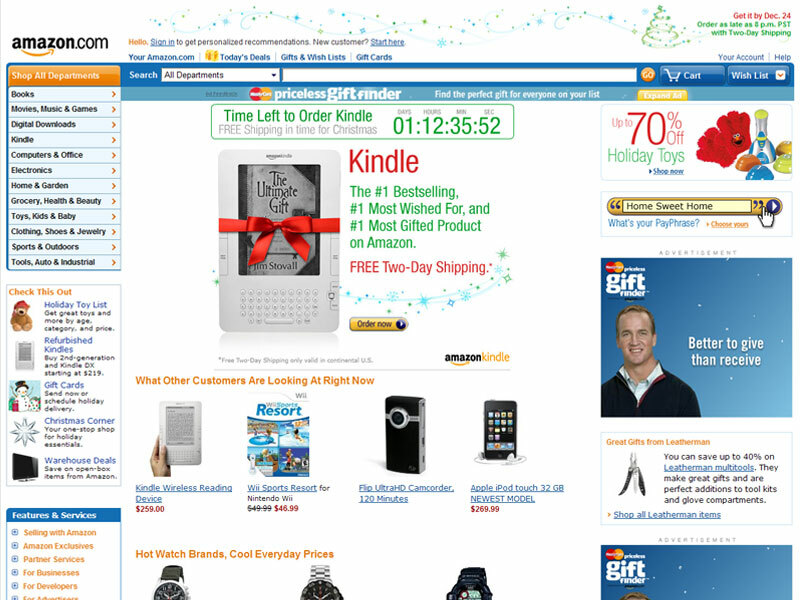 The service takes a percentage of your sale and also charges you a transaction fee of $1. That being said, you aren’t subject to anyone else’s vision of how much your product is worth. 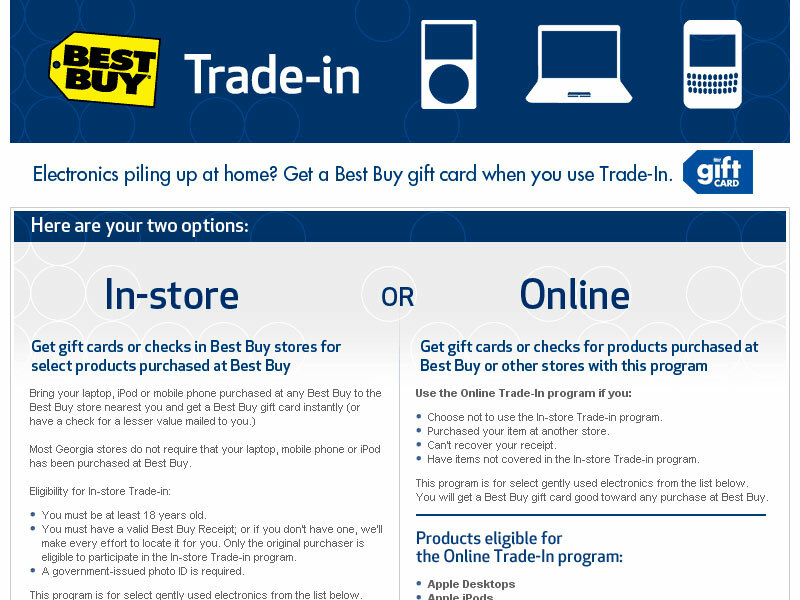 Best Buy offers both in-store and online trade-in programs. We highly recommend the online service because it offers a wider range of products that they’ll make offers on, whereas physical stores will only accept Apple iPods, Apple Laptops, Mobile Phones, and PC Laptops. Trade-in or sell your gear back to Best Buy’s online gear buyback service, and your options expand to include Apple Desktops, Apple iPods, Apple Laptops, Camcorders, Car Audio Receivers, Flat-Screen Computer Monitors, Game Systems, GPS, home theater receivers, phones, PCs, PDAs, servers, digital cameras and even HD DVD Players. You can get either a gift certificate for trading in your gear or a check, but check values are always less than what you’d receive in equivalent trade-in credit. Note that there’s an important catch you should be aware of as well: You must have purchased the equipment at Best Buy originally to sell it back to the company (representatives ask for a receipt or can look up the receipt for you if possible). You don’t, however, have to wait for someone to buy your gear, like on Amazon, before you get paid. 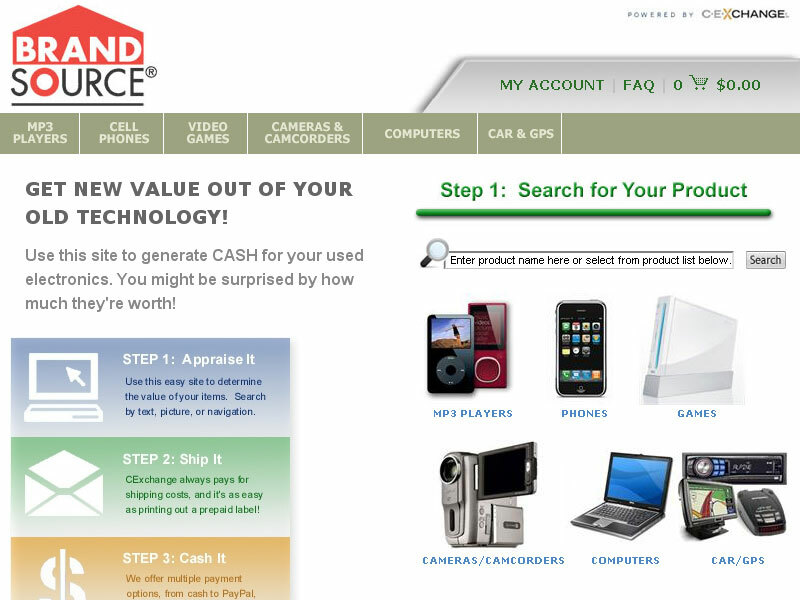 One of our favorite new sources for getting top dollar for your used electronics is BrandSource, which just launched its “Cash for Gear” program (BrandSource.cexchange.com). At the company’s consumer electronics (CE) exchange, you can sell anything from digital music players (we got $148 for a 16GB iPod with “minor scratches”) to GPS systems (a Magellan 4250 GPS with “light wear” fetches $44.54) to digital cameras (a Canon Powershot A520 goes for $17.49) to gaming systems and games (Nintendo Wii, $133; Assassin’s Creed for Xbox, $4.32). You can get the value of your gear in the form of cold hard cash (okay, a check), a gift certificate, or you can even donate your proceeds to charity, making it a very cool option for those who want to give a little whilst getting rid of clutter. If you have a lot of high-end gear you want to sell, like an expensive projector or speakers, try out audiogon, videogon, and AVSForum. These sites don’t buy gear outright, but you can set your price and sell things here, with some presented in an auction format. All three services cater to home theater and music enthusiasts, so you have people looking to build great systems for a reasonable price. Your gear will usually go for great prices here as higher quality and esoteric gear retains its value well. For example, a pair of Meridian DSP7200 speakers, which originally go for $35,000, were auctioned off recently for $22,000. Sellers usually take great care of their gear, and only sell when they decide to upgrade to a better model. There are so many places to sell your used equipment online, it’s mind-boggling. For example, iOffer is also a good place to sell your stuff, and you’ll find a lot of vintage electronics here, like LaserDisc players, 8-track players, and even pagers! Of course, you can always try eBay or even Craigslist as well. 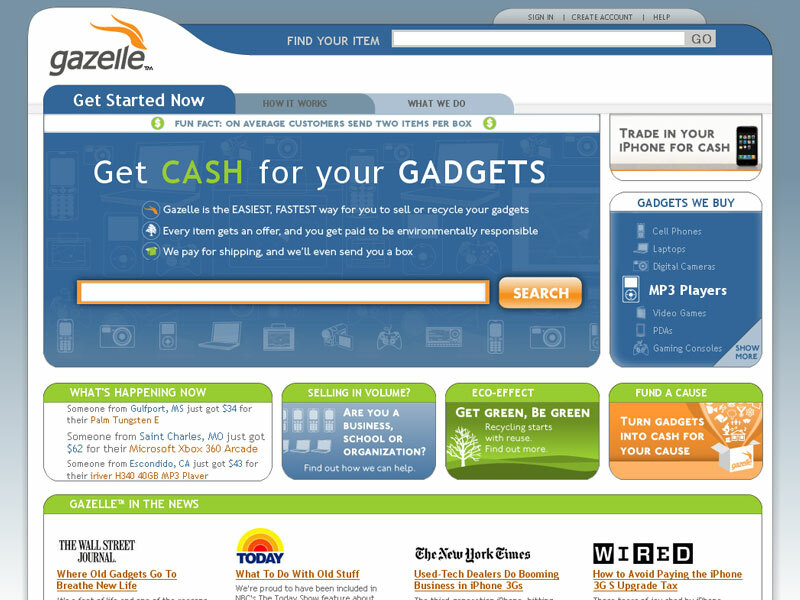 RapidRepair.com is great for getting rid of your Apple iPod or iPhone (or repairing it) too, while YouRenew.com takes a green approach to offering cash for gear (“get paid to recycle”). Also be sure to check out our inside tips on getting more for used gadgets to fetch the best prices on your electronics using these and other resources, and remember – every penny saved takes you one step further to a purchase of a exciting new high-tech upgrade. What’s not to love? *Also check out our article on Technology That Holds Its Value.